This book is a welcome, no-nonsense addition to the many straight-shooting financial guides on the market. 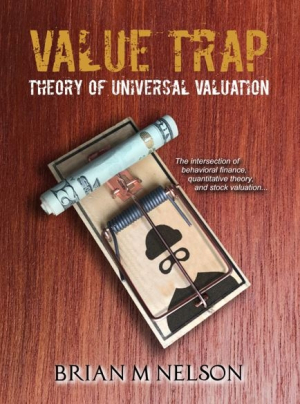 Brian M. Nelson’s Value Trap: Theory of Universal Valuation is a convincing, data-driven examination of enterprise valuation that shows how investors can use information to avoid making costly mistakes. As the founder and president of an independent investment research publisher that focuses on equity and dividend growth, Nelson is an authority on tracing the intricacies of investing in the stock market. His book details how objective examinations of any and all data are essential prior to jumping into potential investment deals; they can be the difference between making a smart decision and one to regret. Here, successful investment is based on understanding three elements of enterprise value analysis: balance sheet position, hidden assets, and operational cash flow. Understanding these components, any investor will know whether to move forward with an investment or not. The best way to insulate oneself from falling for too-good-to-be-true gimmicks is to do your research. There are no shortcuts to savvy investing, as the book makes plain. Divided into three sections—on history, financial theory, and practical application—it will be useful both for freshly minted investors and advanced practitioners, as it addresses the full spectrum of information on investing. Casual investors may be inclined to skip the theory section, but data hounds will find much to savor there. Understanding a potential investment inside and out and studying best practices sounds like solid advice, but as Value Trap explains, there are plenty of slick dealers out there trying to get would-be investors to believe that some magic trick will lead to a pot of gold, and anyone attempting to predict the future when it comes to investing should be avoided at all costs. Investing isn’t rocket science, but it does require careful thought, and this book is a welcome, no-nonsense addition to the small cadre of straight-shooting financial guides on the market.